White Lake is defined geologically as a “drowned river mouth.” The lake extends 5.1 miles from the mouth of White River to the point at which it flows into Lake Michigan. It covers 4 square miles and encompasses 2571 acres. White Lake is known for its scenic beauty, sailing, boating, wildlife and year around fishing. It is a popular tourist destination and summer residence for many. The White Lake Association is dedicated to maintaining and improving the quality of White Lake for the health of its residents and its fish and wildlife through monitoring and education. White Lake featured in The Michigan Riparian magazine! 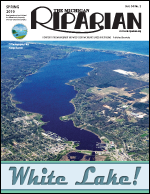 White Lake is prominently featured in the Spring 2019 issue of The Michigan Riparian. The article, written by WLA board member Deb Hays, is titled “The Magic that is White Lake.” A White Lake Association membership includes a subscription to The Michigan Riparian magazine, and members receive four thought-provoking issues per year! White Lake Association has lots of good news to share in our April 2019 Member Newsletter. 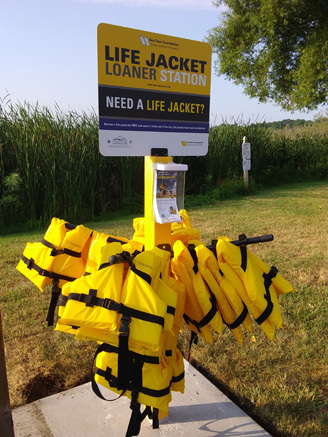 The White Lake Association – through a partnership with boating safety nonprofit, the Sea Tow Foundation – has announced the opening of a new Life Jacket Loaner Station, which became available to West Michigan’s White Lake-area boaters in mid-June, 2018. » View the WZZM 13 News Coverage! We are located in West Michigan, in the NW corner of Muskegon County. We have lots of good news to share about your White Lake Association! As we all turn our sights to spring and warmer weather, we look forward to yet another season of enjoyment on beautiful White Lake. A large part of WLA’s efforts will continue to focus on maintaining our lake by regularly performing tests for dissolved oxygen temperature and Secchi Disk Transparency through the Cooperative Lakes Monitoring Program (CLMP). WLA volunteers also take water samples for chlorophyll and total phosphorus determinations. These annual results can be viewed on our website, whitelakeassociation.org under Testing Results. In the past, much of this testing was performed by WLA Scientific Coordinator Dr. Tom Tisue, who currently is on sabbatical. Tom trained several board members on these testing methods, and this group is furthering their knowledge by attending a free, two-day CLMP training session in May. The board is grateful to Dr. Tisue for his many contributions to WLA. Though not as active as he was previously, Tom continues to offer valuable guidance to us. In more news, as a WLA member, your annual dues of $35 includes a subscription to Michigan Riparian Magazine. We’re excited to share with you that the Spring issue of this magazine, published in mid-April, features an aerial shot of White Lake by photographer Marge Beaver on the cover, along with a seven-page center spread on White Lake and all that it has to offer. It also includes information on WLA and our goals, activities and accomplishments. And that’s not all. White Lake also will be highlighted in the June issue of the magazine with stories on our successful life jacket loaner program, test results from the 2018 invasive plant species study and a reprint of the White Lake Beacon front-page story on the 1800s shipwreck that resurfaced just outside of the White Lake channel last December. 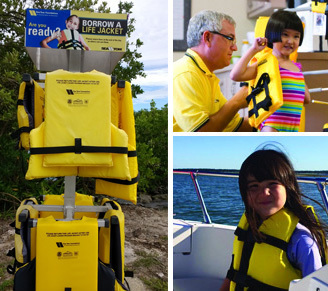 Speaking of our life jacket loaner program in partnership with the Sea Tow Foundation, WLA’s 2019 grant proposal for an additional station at the Scenic Drive launch has been approved. This means an additional 48 new, USCG-approved life vests in varying sizes available to boaters to borrow for a day of boating, then return when they bring their boat back in. And all at no cost to WLA. The permanent, metal stand for the jacket is being built to Sea Tow specs by former WLA President Dave Rikkers. 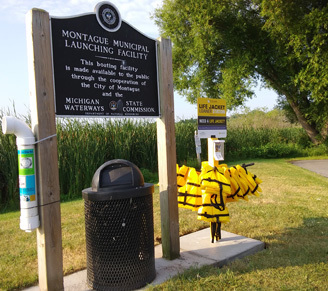 As with the existing station at the Montague Boat Launch and Fish Cleaning Station, the new station will be monitored regularly by WLA volunteers to ensure clean and safe jackets for all. We also are happy to report that last season’s return rate on the life vests was 98%. People are appreciative of the program, and they don’t take advantage of it. Be sure to check out the WZZM-TV coverage of our initial life jacket loaner station ribbon cutting on our website, whitelakeassociation.org. In March, WLA participated in the White Lake Area Chamber of Commerce Business Expo held at Whitehall High School in conjunction with the Rotary Pancake Breakfast. The WLA booth garnered lots of awareness from the 1,000-plus attendees and resulted in a number of new members and volunteers eager to learn the water testing procedures. In addition to the WLA efforts outlined above, it’s important to remember that WLA also maintains the weather station and webcam at the White River Light Station, along with partnering with the Steelheaders to install and maintain the “no wake” buoys on the east and west ends of White Lake. One of WLA’s goals is to attract new members who care about White Lake as much as we do and are willing to get involved in maintaining a healthy lake for generations to come. We certainly thank you for your membership and welcome other riparians and residents to join. Membership applications are available on our website. In addition, WLA board members are available to make a presentation on WLA efforts to any local school or organization. Contact WLA Board President Dave Hays at 231-740-0266 for information. We have a new weather station in place at the White River Light Station. Thank you to all who attended our meeting last nite. Special thanks to Dr. Tom Tisue for his years of wonderful service, but for a very good talk on the current condition of our lake. Thank you again.